Officials from the three countries met in Brisbane last week. Fiji and PNG’s trade with the United Kingdom is currently administered under an interim deal with the European Union, but that will change when Britain leaves the EU. 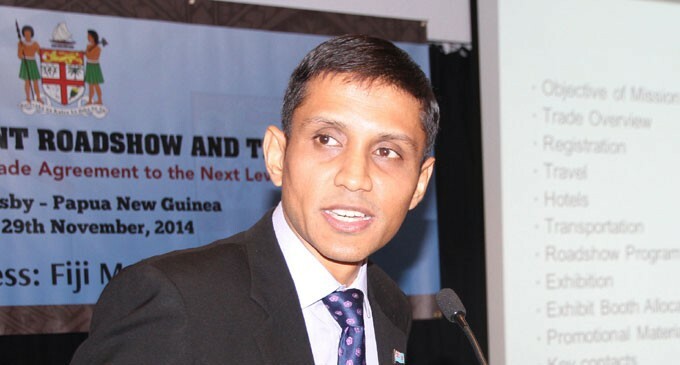 Fiji’s Shaheen Ali said the countries were not re-negotiating the terms of their current arrangement under the Interim Economic Partnership Agreement (IEPA) between the EU and the Pacific States. He said they were only undertaking a technical exercise to ensure the agreement’s framework can be legally applied to Pacific’s trade with the UK, to ensure that there was no disruption to the current trade. Fiji said they also discussed ways to strengthen current trade through improving the IEPA and ensuring it serves the needs of business and helps integrate developing countries like Fiji and PNG into the global trading system. IEPA but only undertaking a technical exercise to ensure that the IEPA framework can be legally applied to Pacific’s trade with the UK, to ensure that there is no disruption to the current trade," Mr Ali added. Fiji, together with Papua New Guinea, had the first technical dialogue with the United Kingdom regarding the future of its trade relations after the UK exits the European Union. The Fijian delegation which was led by Ministry of Industry, Trade and Tourism permanent secretary Mr Shaheen Ali had the meeting in Brisbane, Australia on March 20-21, 2018. "The UK has begun the process of exiting the European Union (EU) and in this endeavour the UK is working with the African, Caribbean and Pacific (ACP) countries to avoid any trade disruptions, during and post withdrawal," Mr Ali said. "UK’s engagement with Fiji and PNG is under the current Interim Economic Partnership Agreement (IEPA) between the EU and the Pacific States. The discussions focused on the new Fiji/PNG-UK bilateral arrangement that will replicate the existing IEPA with EU, as a means to ensure continuity of trade. The Parties in the next stage will look at further improvements to the existing IEPA framework, post UK’s exit from the EU." "The UK, Fiji and PNG are not re-negotiating terms of the IEPA but only undertaking a technical exercise to ensure that the IEPA framework can be legally applied to Pacific’s trade with the UK, to ensure that there is no disruption to the current trade," Mr Ali added. The parties also discussed avenues to advance, deepen and strengthen the current trade through improving the IEPA and ensuring that it would serve the needs of the private sector and facilitate the integration of developing countries like Fiji and PNG into the global trading system.